Solar energy is the energy of the future. It is strongly cementing its place in the renewable energy department. Solar energy can be converted into electricity with the help of solar panels that need to be mounted on a roof top or in an open field. It is the most efficient, reliable, pollution free and easily convertible sustainable source of energy. The process of converting sunlight into electricity is known as the photovoltaic effect. Solar Panels or PV modules contain photovoltaic cells which are wired together and sealed below a tempered glass cover. The panel is wrapped with the help of aluminium frame to protect the edges of the glass for safe mounting. When multiple panels are joined, then they form an array of modules. Then this solar panel generates DC power. Solar array or panel first collects the sunlight during the day time. Then it turns the photons of the sun into DC electricity. The process involves photons knocking out the free electrons from their atomic hosts. 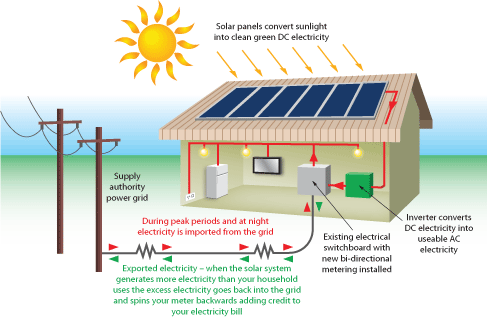 Then the inverter or micro inverter present at the backside of the solar panel converts the DC electricity into AC or alternating current electricity that could be used as electricity for the home. The electricity travels from panel to the net meter or the utility meter. Here the net meter measures the energy withdrawn from your system. It sends the excess current back to the power grid. After flowing through the net meter, the electricity is distributed to your home to run appliances like your fan, refrigerator, air conditioner, and other electrical items. The excess power that you give back to the grid will be taken by the utility company, and it will supply you that credited electricity whenever you run short of solar power. Variety Solar is always dedicated to providing the best solutions regarding Solar panels to its customers.